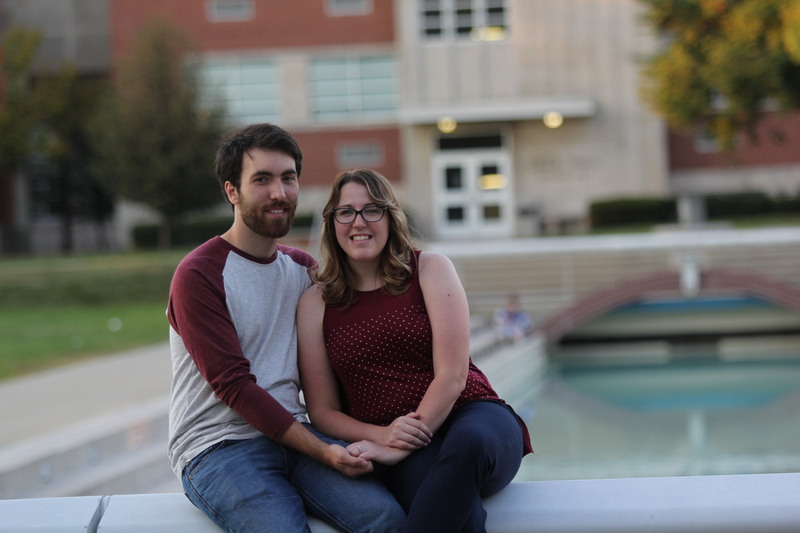 As University of Indianapolis alumni, we posed for engagement photos at the Smith Mall canal. Photo by our good friend Ben Zhang. I have some big news to share. At least, it’s big to me. It seems that every year the news gets bigger, and life gets harder yet better as I get older. Faster than you or I or anyone can keep up with, life moves on. And it doesn’t stop. Thinking back a mere five years ago, I had just returned to Indianapolis, a rejected west-coast transplant. I was working for my dad (again) and living in my sister and brother-in-law’s spare room. Way down my priorities checklist was enrolling in classes at Ivy Tech Community College. Their green and gray recruitment letters arrived once or twice a week. But I had other things besides education on my mind. I was falling madly in love with a woman. We were just friends. One night, though, we got dinner and played board games, then sat on the hand-me-down wicker furniture in her apartment, just talking, watching movies. She sat on “big wick” while I claimed “little wick.” We talked until dawn, and we walked outside to see the sunrise. Only, it was overcast. We couldn’t see night changing to day, but we knew something was different, that good things were on the horizon. …We’re going to take our talents to Minnesota. I will be pursuing a Master’s of Fine Arts in creative writing—lovingly known as an MFA—at Minnesota State University, Mankato. Basically, I will be writing a ton, and hopefully teaching or employed with the English department in some capacity. Stephanie will likely be doing what she does, just working remotely. The cats plan to continue being ornery, and the buns are trying to con us into more treats. Home of the Mavericks. Photo via Minnesota Public Radio. 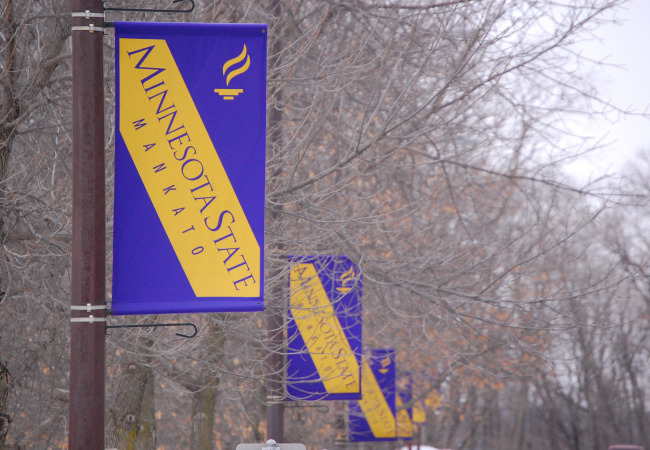 For those of you who haven’t heard much about MSU Mankato (and there might be one or two) it’s a small state school located roughly 85 miles south of the Twin Cities. The school started with 27 students in 1868. Back then, it was called the Mankato Normal School, and weirdos like me might be unacceptable at one time, but the school has had several identity crises over the years. Fortunately. Mankato currently boasts “[m]ore than 15,000 students, including more than 900 international students from more than 90 countries.” And the Mavericks have men’s and women’s NCAA Division I hockey teams. The campus has about three times more students than my alma mater. Photo via bestvalueschools.com. Don’t worry—we plan to make regular visits and keep in touch with all our friends and family. If nothing else, I have to return twice a year. “You’ll have to commute for cleanings,” my dentist has already demanded. I’m proud, and a bit terrified, to move on to something new. To take the next step towards my dream of writing books. It’s a big move and big change, and I am so grateful for support from my family, friends, former professors who wrote letters of recommendation, employer, and my bride to be. After I accepted the offer this past weekend, Stephanie and I celebrated at the Broad Ripple Brewpub, like we did when we got engaged. Unlike that morning five years ago, the sky wasn’t overcast. But we got the feeling that, once again, something is different. And good things are on the horizon.